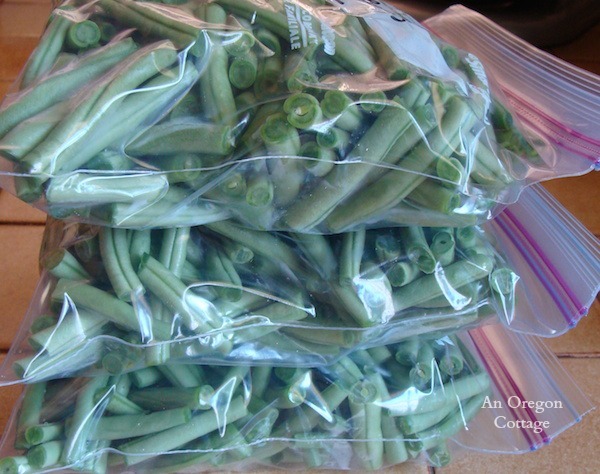 Do you guys remember when I wrote about my family not liking the texture (squeaky and rubbery) of blanched and frozen green beans so I rebelled against the conventional method and froze them unblanched? Since I published that post almost two years ago, it’s become one of my most visited pages, almost surpassing my soft 100% whole wheat dinner rolls (but not quite, because, hello- rolls vs. frozen green beans?). 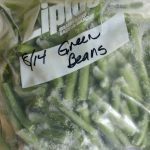 I’ve gotten a ton of comments with many people telling me that they don’t blanch either or that they remember their mothers or grandmothers freezing green beans without bothering with the blanching process. It’s nice to know I’m not alone and that many people are like my family and like the beans better without blanching first. From Virginia: just ate a bag of ” frozen” Blue Lake. not blanched string beans from july 17, 2012. a little ice on them. washed them under cold water to get rid of most ice. still frozen, put in pot, seasoned my usual way-little salt-cooked a short time not to mush time. they were delicious!!!!!! june 17th——2014!!!!!!!!!!!!!!!!!!! Hi, nice to meet you. I liked how you freeze green beans. Thank you for sharing. Wow,I didn’t know that you could freeze beans without blanching. I was told that it is the blanching process that preserved the green color. After looking at your freezer beans, I too find blanching unnecessary. Thank you. There is always something new to learn. I too live in the PNW, in West Linn. I am headed out today to pick pickling cucumbers, corn, peaches and green beans out on Sauvie Island. So yeah, I’ll need the fastest way to put these up. I just wanted to write and say that after years of using the straw method for getting the air out, I bought a Food Saver. It isn’t as quick and simple as zip locks, but I really enjoy using it anyway. My husband likes using it too, so I can actually get some help on canning weekend. I am surprised you don’t use one. Any reason I should know about. So happy to be putting up my corn and beans without blanching/cooking. I haven’t done green beans for years, but will do them this year with your vote of confidence. Thanks! I hope you like them this way, Natalie – it will save you time for sure! Okay, I do get the part about the gadgets, they take up space. I get mine out for weekends and projects like this and have it put away the rest of the time. Oh, and BTW, I do reuse the Food Saver bags until they get too small, since you do have to cut off an inch or so of the top to get them open, and have found a good price for a generic brand. Oh, that’s good to know – I wasn’t sure you could reuse them. Hi Jami! I just watched you video on making organic garden pest spray. Can you you this on tomato plants as well? We are having trouble with them and we are not sure why but I would like to try this spray if it is ok to use on them. Thanks in advance! Yes, readers have told me it has worked on tomato plants. Be sure to spray in a cool part of the day and do the first spray on just a test area to be sure. Good luck! do you trim the ends of the beans before freezing? Yes, I always trim both ends – I don’t like the sharp ends found on the fillet beans I grow. I love this method and will definitely try it this year. Can I ask how you cook them when you’re ready to eat them though? Hi Debbie! We use them in soups and stews a lot and for a side dish cook them covered with a bit of chicken broth, onions and bacon in more of a ‘long cook’ (20 minutes or so) – they aren’t crisp like fresh, of course, but they don’t have that squeak like this and work well with these methods of cooking. Can anyone tell me if you can freeze fresh herbs and if so how do you do it? It depends on the herb, Juanita, but many like oregano and thyme can be frozen on a tray (leaves only) and then transferred to a baggie to use as needed. Most say to puree basil in a bit of olive oil and freeze in ice cube trays (about 1/2 full) to use in sauces, soups, and such. Chives are really good frozen, I think – but all will be best when used in a cooked recipe, since the texture is changed. I love this site! Just found it and will not blanch my first ever crop of pole beans! So excited… I have a question about freezers – my 2 yr old maytag upright, frost free has died twice – something about the thermostat and the defrost cycle. I won’t bore you with the maytag horror story. Suffice to say, I stopped using it. I am confined to the refrigerator’s freezer section which limits the amount I can freeze although it does a very good job! Do you or your readers have a preference for frost-free over non frost-free, upright or box style freezers? The reviews are all over the place and I would prefer to hear some opinions from serious users!! Thanks! Thanks so much, Wendy – I’m glad you’ve found useful things here! I have always read that for larger freezers that will hold food a year (or more), it’s best to get a regular, non-frost-free freezer to minimized freezer burn issues. There is the defrosting maintenance, though, so you need to weight that and decide what would be best for you. I went with a regular freezer and I always prefer an upright – they are easier to fit in the house, easier to organize and I HATE pawing through ice-cold stuff in the dead of winter trying to find something buried under a pile. But that’s just me. 🙂 So, I really think it’s a personal decision – most appliances will freeze things well for the year that you’ll need them. Thanks for the reply Jami. I am starting the search now. I will try to find one that will last longer than a year without having to call the repair department! Defrosting sounds less expensive! I wash and dry bush beans before freezing as follows: wash whole beans, place the beans on a clean bath towel atop a flat surface like a countertop or table. Spread them apart from each other. Place a desk fan behind them and oscillate the fan across the beans. Turn the beans over if needed. They are dry in about 10 minutes max. Feels good on a hot summer day in the kitchen, too. Then cut and bag as Jami suggests. An enthusiastic “Hi!!!!!!!!!!!!! !” from North Carolina! I literally thank God for this website! I’m so excited at all of the wonderful things I can learn here! Finding this is such great timing, as our family has just begun a real-food revolution! Yay!!!!!! OK, about not blanching beans. Thank God for that too! I have a question. I am very short on time and somewhat overwhelmed daily (lol), so I really really don’t want to wash my beans and then have to dry them. I really, really just want to cut, bag and freeze. I’m just following my heart here. I need simplicity. So, they certainly have some dirt, but I’m not one who thinks dirt will kill you. And I totally just plan to wash them well before I cook them, after I’ve taken them out of the freezer. Is there anything wrong with just not washing them before freezing, if you’re going to wash them prior to cooking? I know that I CAN wash them, but, I really don’t want to. It’ll save me a ton of time not have to dry them. They’re grown organically, but they do occasionally touch the ground. Again, love the website! Thank you! I love white half runners, I am trying them for the first time vacuum sealed in the freezer. Did not wash them, so I am anxious to see how they taste. Jami, thank you so much for the video – I was a farmers daughter in Somerset here in England and never knew you could freeze without blanching. Just about to give your idea a try. thanks again. Jamie, that’s why I can my green beans….I don’t like frozen green beans period. Never have, and I’ve always bucked the system about the blanching rules and regs…still don’t like them frozen! Only time I like them is if they’re going into a pot of soup…but I never blanch my corn. It always seemed to be mushy if I did. Much better not blanched. What a nice video. I usually blanch or can my beans. I have put them I to the freezer without blanching before but they always ended up with little white spots. Maybe that is from the water on them. I’ll have to give your method a try and really dry them well after washing. Great video, Jami! I like your not washing tip, except it seems my beans always have dirt on them! I’m have to figure out how to grow clean green beans, like you! 🙂 Well done.